Sometimes your skin isn't as smooth as you'd like it to be. Dryness and the odd lump and bump can make your skin look uneven, and sometimes putting make-up over the top just highlights the issue. If you've had an outbreak, even after the spots have long gone, the skin surface can remain raised, and take a while to even itself out. To give things a helping hand, I like to use Estee Lauder's Idealist Skin Refinisher but in a recent effort to save some pennies, I went on a hunt to find an alternative. And I turned to my trusty TK Maxx which came up with the goods. 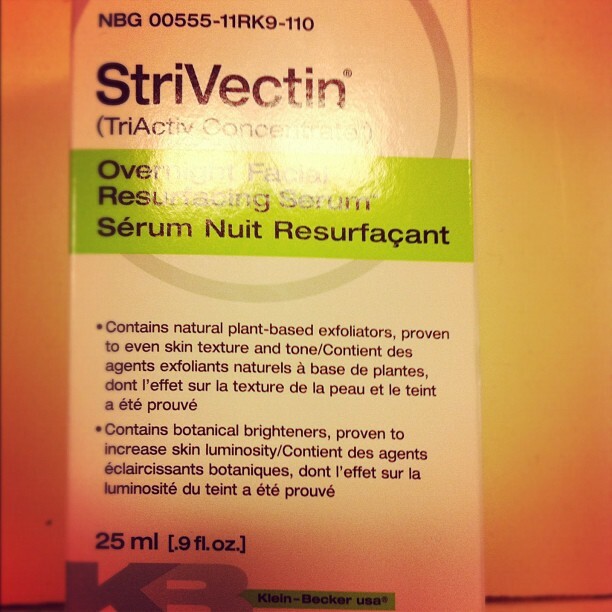 I found Overnight Facial Resurfacing Serum by StriVectin for £19.99, currently selling for £51 at Space NK. It claims to remove dull, dry flakey skin, smooth skin texture, visibly diminish pores and wrinkles, brighten skin tone and improve luminosity. But then I also found this Rejuvenating Facial Serum by Glycoderma for £7.99 and bought this one instead. Its main active ingredient is Glycolic Acid, which is a fruit acid and in the group of acids known as AHAs (Alpha Hydroxy Acids). It works to get rid of old, dead skin cells on the surface of your skin, to reveal the younger, fresher skin cells underneath. And for that reason, it's used to improve the texture of your skin, by removing dry, flaky skin, and minimising the appearance of pores, fine lines and wrinkles, scarring and pigmentation. If you've never used a product with Glycolic Acid in it before, then maybe just try and get hold of a sample first - especially if you've got sensitive skin - as some skin types just don't get on with it. I've used products from this range found at TK Maxx before, because I find that for my skin, Glycolic Acid helps keep pores unblocked and keeps spots at bay. Hope you find some at a branch near you. oH!Me likes the look of this one! May go and investigate at TX Max this weekend! Actually quite fancy a full on Glycolic acid facial peel myself and have found the Spire Hospital in Bristol offer a number of options!! Just need to see if I can get this one past Dr Hesketh!